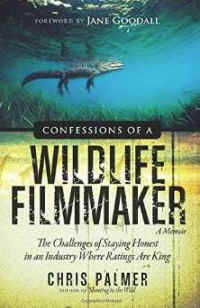 Confessions of a Wildlife Filmmaker: The Challenges of Staying Honest in an Industry Where Ratings Are King by Chris Palmer is available through Amazon. In an era of global media saturation, Confessions of a Wildlife Filmmaker: The Challenges of Staying Honest in an Industry Where Ratings Are King is a timely and important book. Author Chris Palmer is a wildlife filmmaker. The book is written as a memoir in a series of chapters called “confessions,” and Palmer acknowledges that in his early career, his “ignorance, naiveté, and self-interest” kept him silent about his misgivings about cutting corners and political maneuvering. He also admits that his actions made him “complicit.” After years in the industry and serious self-reflection, he decided to draw back the curtain on what really goes on behind the scenes. What’s truth? What’s fiction? How many of these shows are staged? Is everything a “reality show”? Palmer laments how many wildlife films are doctored and faked and how many filmmakers ignore the impact that production crews have on wildlife. Palmer closes with a five-part challenge: for filmmakers to condemn irresponsibly obtained footage, for viewers to use social media to make their objections known, for media outlets to be more discriminating in what they hype and promote, for educators to include ethics in their curricula, and for networks to get back to ethical ideals. Chris Palmer is a professor, speaker, author, and environmental/wildlife film producer who has swum with dolphins and whales, come face-to-face with sharks and Kodiak bears, camped with wolf packs, and waded hip-deep through the Everglade swamps. Over the past thirty years, Chris has spearheaded the production of more than 300 hours of original programming for prime time television and the giant screen IMAX film industry. His films have been broadcast on numerous channels, including the Disney Channel, TBS, Animal Planet, and PBS. His IMAX films include Whales, Wolves, Dolphins, Bears, Coral Reef Adventure, and Grand Canyon Adventure. In the course of his career, he has worked with the likes of Robert Redford, Paul Newman, Jane Fonda, Ted Turner, and Ted Danson.